How about donating it to a zoo in Sri Lanka. I mean in a country where housing and food for humans is scarce, where decent health care is a bona fide luxury, where simple chicken is a weekend special...do you really need to spend time, money and effort on a reptile? Minivan, do you seriously think that a barbaric inbred society such as the Maldives, cares about how this animal is living? Plus, most people living in Male live in horrible living conditions, so I doubt they would care. Many islanders living in Male' for rent are in same condition as this Kinboo..
Save it... Take the kinbo some where near..country. Or else build a new cage...large enough for two. This is true abusing. Kinbo is being suffering for almost 10+ years. i think the best thing to do is to have a nice kinboo barbecue, for the kids. nobody wants that kimboo. just kill it and eat it. problem solved. Minivan is joking on this one. Its a weekend, and a joke is permitted. On the serious side, no Maldivian would give a second thought to an animal. You see was above all animals, above all other races, and certainly we are the ONLY ones destined for the everlasting Heaven. 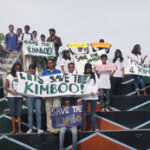 what is so barbaric about keeping this kinboo in the park. It is fed nicely and it sleeps comfortably. . We didnt’ go out and fish the kinboo. Comes to mind the word ‘battery hen’. Somehow when the kuffar does a thing, its gentle its courteous and its alright, but when we muslims do something its automatically barbaric. what kind of logic is this? Why don't they hand over this Kinboo to one of the Zoos in Australia. I called Wilson to raise an awareness program in Australia to stop discrimination there and learn to respect the asian community alike. There are no superior or inferior human being and all are equal and they should not discriminate people on their skin color. This is much more important than a crocodile in a small enclosure . I feel terrible for all the animals in this country. Someone should hire a gang member to shoot poor Kinboo in the middle of the night. Put this creature out of his misery. If he could even move after all these years, I would love to see him set free and eat a few of the gawking Maldivians. He probably can't leave the country because his owners are "keeping his passport safe". i say euthanasia! that is the merciful thing to do. I have been wondering for years how that poor creature could possibly survive its ordeal.A caretaker once told me it was fed only half of its ratio now as it was growing too big for its cage many years ago.Yet...sadly...most of Male's inhabitants share the kimboo's fate and live jammed up in crowded places. What such extreme lack of breeding space does...shows our present political situation: though physically surviving...barely mentally healthily so!We are all mad!!! 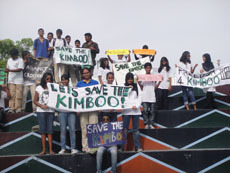 Freeing the kimboo would be at least an act of understanding where the true problem lies!!!!!!! !